Are you looking in the mirror and noticing that your eyelids seem to be drooping or that your brows just aren’t as high as they used to be? This is a common change that we tend to notice as we age. Genetics can play a part as well. The brow area seems to be one of the first areas on our face to show our age. The usual go-to for correction of fallen brows has always been a surgical brow lift, however not everyone is quite ready for surgery, and some people just cant afford the downtime or cost for that matter. Lasting Looks Anti-Aging and Laser Clinic offers non-surgical solutions to help raise your brows. Some of the non- surgical ways to lift your brows are by using Botox Cosmetic, Ultherapy, Filler or a combination of all three. When Botox Cosmetic is administered correctly to the forehead area, one can achieve a definite brow lift with a smooth transition of the arch. This in turn will aid in lifting the eyelid, giving you more lid space as well as a more open and youthful looking eye. As well as Botox in the brow, we can also place a filler such as Juvederm or Teosyal in the temple area. By doing this it can lengthen the tail of the brow which in turn causes a lifting of the eyelid and brow as well. The last but not least method of lifting the brow non-surgically is with a procedure known as Ultherapy. 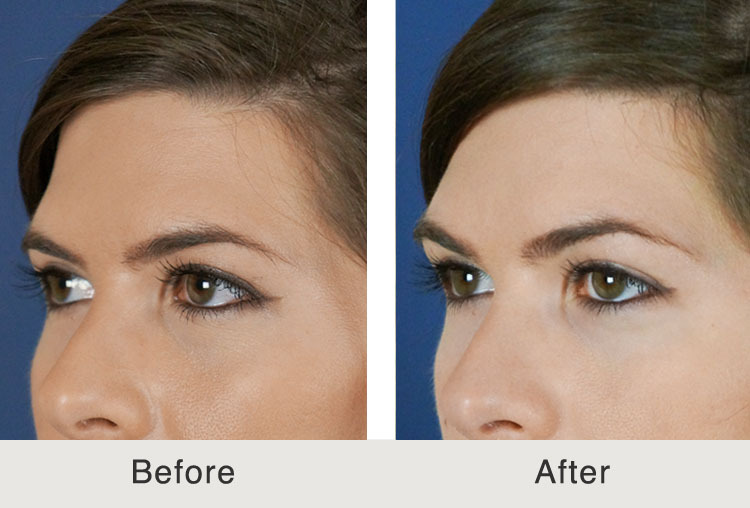 If you choose to lift the brow with Ultherapy, your results will last longer than it would with Botox. Ultherapy works at tightening the muscle in the temple area as well as above the brow using Ultrasound energy. The procedure and the results are very natural and can last for years. All treatments at Lasting Looks Clinic can be used in conjunction with one another or individually to give pleasing results.